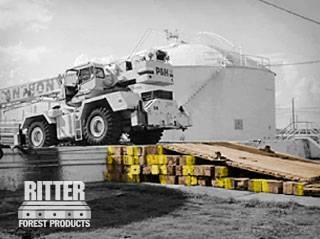 Ritter Forest Products is a company that can help you secure heavy equipment, keep your employees safe, and protect the integrity of any project right up until the very end. We keep thousands of crane mats in stock and provide them to companies conducting projects involving the use of cranes, trucks, and other equipment. You will be able to work safely when you have hardwood crane mat sales and rentals in Maryland from Ritter Forest Products, and you won’t have to worry about any major malfunctions with a piece of equipment. The crane mats that we keep in our inventory are perfect for placing on a variety of different terrains. But at times, we understand our clients need specific sized crane mats in Maryland for certain kinds of jobs. With that in mind, we can produce a custom mat and timbers for you so that you can carry out any job successfully. You can choose how big your crane and timber mats rentals will be as well as what kind of wood they are made out of so that they fit your needs. Crane mats play an important part in jobs that require the use of equipment. They will allow you to drive equipment over any surface, no matter how uneven or difficult it might be. Our crane mats in Maryland can be sent directly to your job site to smooth out surfaces and give you a better worksite. We encourage you to obtain our crane and timber mats rentals before your next major project. The timber mats in Maryland that we produce are made using high-grade materials that will prove to be every bit as durable as you need them to be. Whether you are using them for smaller trucks or extremely large and heavy cranes, they are equipped to handle anything you throw at them. You can use them in a small area for a single piece of equipment or cover your entire site with them for easier navigation to different construction areas. For those who are looking for crane mats that are highly maneuverable, Ritter Forest Products recommends laminated mats in Maryland. Our laminated and timber mats for rent can be moved easily to create temporary roads, stable platforms, and more. You will even be able to attach cables and chains to laminated mats in order to use them for lifting. While the 3-ply laminated mats that Ritter Forest Products supplies to companies are lightweight, they are still every bit as durable as our other crane mats. They are made out of 2x8s and high-grade materials. They just so happen to be lighter, which makes them easier to move. They are ideal for those who will be dealing with lighter loads, but you shouldn’t underestimate them under any circumstances. Every now and then, you will need to use your equipment to perform a particularly tough task, and you will want to make sure it’s as stable as possible during it. The outrigging pads from Ritter Forest Products make this possible. They will slide under your equipment and make it more secure. We can also send you transition pads that can be used to move equipment from the ground level up to an elevated platform without worrying about it tipping over. Those who spend a lot of time building pipelines can testify to the importance of pipeline skids/timbers in Maryland. Pipeline skids are essential to the process, as they will help with cribbing, racking, and elevating pipes. 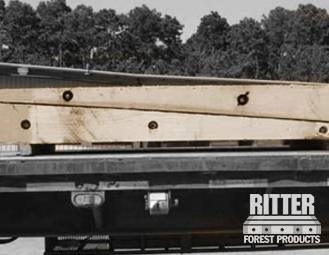 Ritter Forest Products has the right pipeline skid for sale for you and can set you up with exactly what you need to build your pipeline quickly and efficiently. Did you build a temporary structure that needs to be stabilized so it doesn’t fall over, or do you need to prop up a piece of heavy equipment during a project? 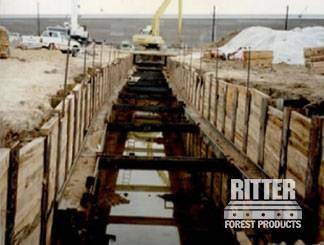 You’ll want to obtain Maryland Shoring material/cribbing from Ritter Forest Products. We can help you secure structures from all sides to keep them standing. 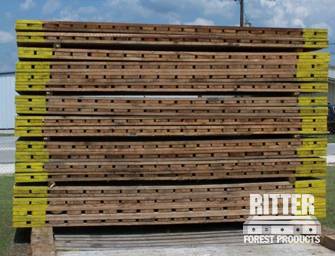 As you can see, Ritter Forest Products offers a range of products that will help you keep your worksite safe and secure. You can protect your equipment, your employees, and the environment with our Maryland hardwood crane mat sales and rentals, pipeline skids, and more. Reach out to us today to place an order.